Quickly & Conveniently 24x7 Anytime - From Virtually Anywhere! No Matter Where They Are! Over 90% of the entire U.S. population currently owns and uses a mobile device daily. Position your marketing to effectively reach, engage and market to the over 90% of both your entire Boston Local Consumer Market and global population that are currently mobile. Over 82% of Them Contact a Business After They Search. (b) Over 75% of ALL Purchase Decisions Involve a Smartphone or Tablet. (c) Over 80% of ALL Internet Searches are Local Searches. (d) Over 90% of Mobile Local Searches Eventually Yields a Sale. Align your Marketing With Today's Consumer Lifestyle. Increase your organization's relevance by marketing in the ways that are expected and more favorable to today's consumer. Today's Consumer is SoLoMo (Social-Local-Mobile). Doesn't it make more sense that your marketing is also SoLoMo? How about doing it effectively and sffordably with the 24x7, whenever... wherever ease and convenience that distinctly hallmarks the expectations and requirements of today's SoLoMo consumer lifestyle. We think so. That IS BOSTON LOCAL. Reach, Engage & Market to Local Consumers Wherever They Are. Place both your mobile marketing landing page messages and local marketing incentives landing pages within the reach of both your Boston local customer/client base as well as that of their social contacts all day, every day whenever...wherever. Your marketing ads, messages and incentives become fully available to every smartphone, tablet, iPod Touch device and most current portable gaming devices regardless of manufacturer or service provider that can access the internet unfiltered. A very 'sticky' communications solution, marketing ads, messages and incentives, once installed or downloaded, stays at the virtual fingertips of everyone all day, every day, whenever... wherever. Over 90% of which eventually leads to a sale. Industry estimates strongly indicate a 1 million+ daily City of Boston Local Mobile Consumer Market and a 6.5 billion+ Global Social Media-driven Consumer Market; all driven 24x7 by a 5.4 billion+ active mobile community. Allow this highly-active multi-billion local and global mobile consumer community to engage your brand across the the entire Social, Local and Mobile landscapes interactively 24x7 whenever... wherever. Doesn't it make more sense that your marketing is also SoLoMo? We think so. That IS BOSTON LOCAL. Reach Your City of Boston Local Consumer Market. Today's SoLoMo Consumers are virtually constantly in motion. Thanks to mobile, they're also always connected. They search local and, when convenient, shop local. They search and shop throughout the day - every day; and mobile allows them to do this from virtually anywhere and everywhere. Mobile is interactive also in the sense that, with BOSTON LOCAL, not only can your entire Boston local consumer market easily and conveniently find, reach and engage you within BOSTON LOCAL, a 100% Mobile, SoLoMo-based, 24x7 mobile marketing, communications and social engagement environment; City of Boston Local Business Owners can easily, conveniently and affordably reach, market to and engage over 90% of your entire City of Boston Local Mobile Market 24 hours a day, 7 days a week, whenever... wherever. Reach even those outside of this 'Mobile' Consumer Market via the social reach that each of your mobile marketing landing pages as well as your mobile eCoupon and eCirculars landing pages will provide. Growing your business in today's consumer lifestyle is dependent mostly upon customer service and engagement as the foundation towards establishing trust and building lasting customer/client relationships; one relationship at a time. For your existing customer/client base, incentives such as eCoupons, eCirculars and Customer Loyalty eCards help you grow organically by encouraging both higher sales volume and frequency. The more trust you earn and the greater the relationship you build can easily add hundreds more new customers and thousands more new direct and social engagement referrals (viral); all from just a single relationship. Likewise, these same tools, used effectively, can encourage new avenues of engagement and sales throughout your social channels and via your existing customers. Once you've secured both your market share and daily profit value within your specific Boston neighborhood, you may wish to expand your marketing into other under-served, yet profitable Boston local neighborhoods. 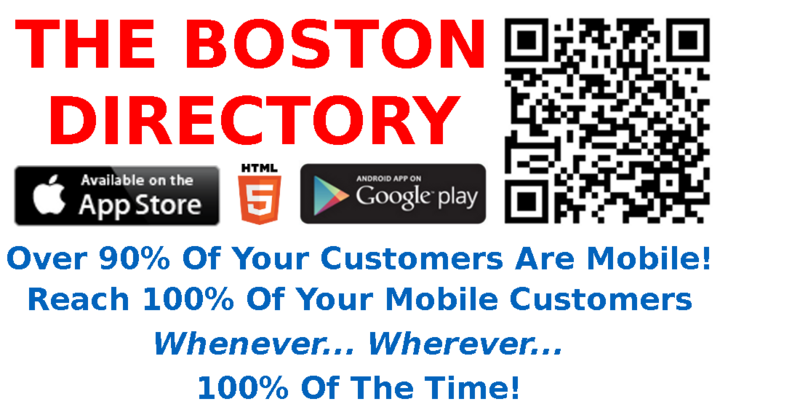 Because mobile marketing landing pages are sorted alphabetically by both type and Boston local neighborhood in BOSTON LOCAL, this may occur either naturally or simply by adding an additional mobile mobile marketing landing page in your selected Boston local neighborhood(s). As a 100% mobile environment, BOSTON LOCAL can effectively and affordably pilot your statewide, regional, national, even your global market expansion.